I can't think of a better person to fulfill this role; especially at a time when immigrants from Mexico are being lambasted on the national political stage. Fernando Valenzuela, who was named one of President Obama's Ambassadors for Citizenship and Naturalization today, had come to America as a chubby 18-year old kid from a poor section of town in Sonora, Mexico. He initially looked out of place on the ballfield with his "Ruthian" physique and childish smile that seemed to reach from ear to ear. Then they handed him a Baseball and everything became clear. This kid had a magic left arm and he would eventually change the game. His rise was swift and the reaction from the American masses culminated into an hysteria that folks called "Fernandomania." Everywhere he went, from games in California to St. Louis, from New York to Milwaukee, fans flocked to the stadium to see the Mexican sensation at work. And he turn heads in a way that made him an inspiration for thousands, if not millions, of Hispanics through the America's. Fernando Valenzuela is synonymous with hard work and determination, and he exemplifies the character desired in this great country. We, as Dodger fans, should be proud that another member of our team is honored as a beacon of hope and goodwill. What is timely about this appointment is that Fernando became a citizen himself just a few months ago, so he surely has plenty to share. He'll be able to provide words of encouragement that immigrants from all walks of life can learn from. Hopefully too, he'll inspire and cause American's to reflect on some of the ill-will being bandied about on the national stage today. 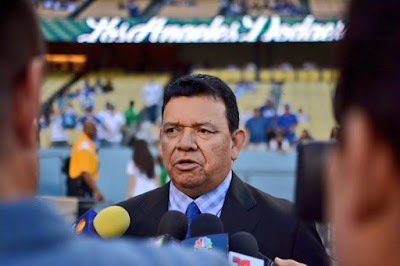 Today, on Citizenship and Constitution Day, President Obama launched the “Stand Stronger” Citizenship Awareness Campaign and appointed Dodger broadcaster and legendary left-handed pitcher Fernando Valenzuela a Presidential Ambassador for Citizenship and Naturalization. In this role, Valenzuela will work with the White House and U.S. Citizenship and Immigration Services (USCIS) in promoting the rights, responsibilities, and opportunities of citizenship among eligible lawful permanent residents and help the “Stand Stronger” Campaign break down the barriers for eligible immigrants and refugees to become U.S. citizens. 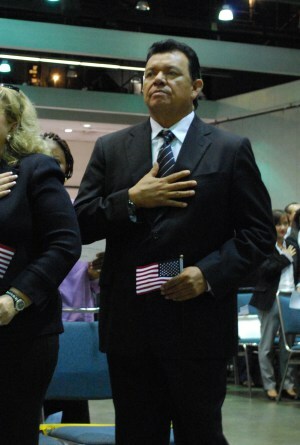 Valenzuela joins three other prominent Americans who are contributing to the arts, business and civic life in the inaugural cohort of Presidential Ambassadors for Citizenship and Naturalization. The Presidential Ambassadors for Citizenship and Naturalization include chef and restaurateur José Andrés, actress Diane Guerrero and singer and songwriter Dave Matthews. This first-of- its-kind collaboration will harness these Ambassadors’ inspirational stories to promote naturalization, bolster integration initiatives, and increase awareness of the contributions of new Americans. The “Stand Stronger” Citizenship Awareness Campaign builds on recommendations by the White House Task Force on New Americans, established as part of the President’s executive actions on immigration. This initiative encourages the 8.8 million lawful permanent residents that qualify for citizenship to learn more about the naturalization process so they can solidify their roots and tap into the incredible opportunities that await new American citizens. Below is a word from the President about this initiative. Photo at the very top via @Dodgers on twitter.